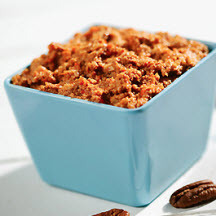 Add red pepper, dry bread crumbs, garlic, lemon juice, cumin, red pepper flakes and pecans to a food processor. Pulse once or twice just to blend ingredients. Add canola oil and blend ingredients to form a smooth consistency. Add salt to taste. Sauce can be stored in refrigerator, covered, for up to one week. Nutritional Information Per Serving (1/20 of recipe; 1 tablespoon): Calories: 45; Total Fat: 4g; Saturated Fat: 0g; Cholesterol: 0mg; Total Carbs: 2g; Fiber: 0g; Protein: 1g; Sodium: 40mg.